Posted on 28, January 2019 by EuropaWire PR Editors | This entry was posted in Agriculture, Denmark, Finland, Food & Beverage, Germany, Healthcare, News, Sweden, United Kingdom and tagged Arla Foods, calcium, dairy products sugar, Hanne Søndergaard, healthy diet, healthy eating, healthy life, minerals, nutrients, protein, RESEARCH, vitamin B12, vitamin B2, vitamins, YouGov analysis institute. Bookmark the permalink. Viby J, Denmark, 28-Jan-2019 — /EuropaWire/ — New research from Arla Foods uncovers a big knowledge gap when it comes to our understanding about food. The survey was carried out by the YouGov analysis institute where more than 7,000 CAWI interviews took place across Germany, Sweden, Finland, Denmark and the UK aged 18+ between 18th December 2018 and 11th January 2019. The research revealed that a quarter of people skip a meal, even though they are hungry and saving time was the most common reason for 37 percent of the surveyed. 23 per cent of people cite losing weight and reducing calorie intake as a reason for skipping the meals. 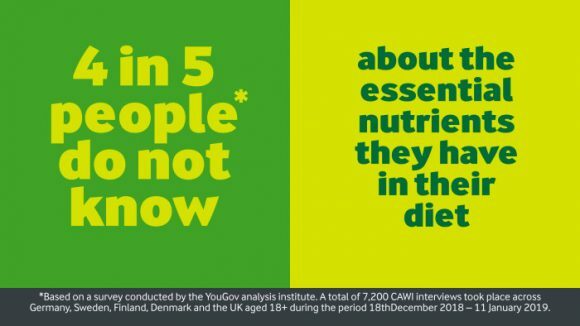 Most surprisingly 60 percent of the people questioned across Northern Europe do not recognise that many dairy products are a single natural source of vitamins and minerals. The findings highlight that 51 per cent state they see themselves as a healthy eater, yet there is still uncertainty when it comes to knowing exactly what we should consume. “As one of the world’s leading dairy companies, we can develop improved products and new initiatives that can inspire better health in everyday life. This means that we have both a responsibility and opportunity to make a difference to global diet-related health challenges,” concludes Hanne. When looked into how countries stand within the research, 2 in 3 people in UK wrongly think there is more than 10 per cent fat in whole milk, while in Finland more than a third believe the fat content in milk is even higher. In fact it only contains under four per cent. The semi-skimmed milk is even lower on fat -around 1.7 per cent. When it comes to Sweden, three quarters of the people found not recognising dairy products as a source of protein while in Denmark 1 in 3 people cut a specific food from their diet. For the Germans in particular only a quarter eat one main meal a day, which may shed light on why almost half of the nation might feel they may be lacking in key vitamins and nutrient. One thing in common found in the research for Northern Europeans is the desire to reduce the amount of sugar in their diets. Over 30 percent of the people in Denmark, Sweden, Finland, UK and Germany admit of cutting out a specific food, with 40 per cent of them saying they aim to omit sugar from what they eat. As a responsible food producer, Arla recognises its role in helping people live a healthier life, through our nutrition criteria. These are the guiding principles that support Arla branded products, to make sure that the good stuff in milk is retained whilst limiting the amount of added sugar, fat and salt.